Canadians know snow, we’re always in search of that pure powder and of course the perfect spot for Après Ski. If you’re a powderhound, most comfortable whizzing through bowls and chutes, swooping down between the trees and chasing that powder euphoria we have a selection of trips to suit your needs. While we love the epic powder experience of the Harmony Zone, we’ll recommend the best runs for your specific interests and skill level. The best memories are often made off the slopes. Restaurants, shopping, spa treatments, maybe a little nightlife - we can suggest the best apres-ski options in Whistler Village. It’s one of the hottest ski destinations in the world. Just two hours north of Vancouver are two world-class mountains with fresh British Columbia powder waiting to be discovered. Whistler-Blackcomb is the site of the 2010 Winter Games, and whether you’re an aspiring Olympian or a total beginner, Whistler has something to offer the whole family. Ski one or ski them all, it’s up to you. Fernie, Panorama, Kicking Horse — we’ll help you choose the right resort for daytime runs and nighttime fun. Remote backcountry lodges or cozy rooms right in the heart of a storybook ski town? Give us your wish-list, and we’ll help turn your dreams into your reality. Deep in southeast British Columbia lies a treasure trove of Canadian ski experiences. Called the Powder Highway, it’s a collection of seven world-class ski destinations in the Kootenay Rockies. Add world-class heli and cat-skiing and you’ll be in a state of powder euphoria. Why ski one when you can ski all three? Let us help you make the Canadian ski trip of your dreams. Just as magical as skiing the slopes of the Rockies is staying at the iconic Chateau Lake Louise. Ask us for our insider tips on the best rooms and most coveted dining reservations. It’s an embarrassment of riches when it comes to skiing in the Canadian Rockies. 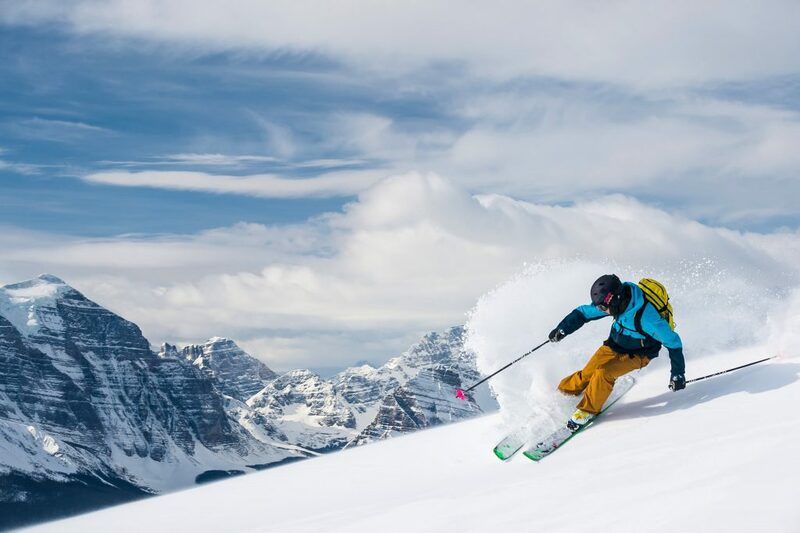 Lake Louise, Jasper, Banff all deliver Alberta powder at it’s finest in the most majestic alpine setting. With so many choices, knowing where to go and what to do can be daunting, so let our insiders help you choose the right ski vacation for you. Apres-ski isn’t just for downhill. In the Okanagan Valley, the reward of award-winning BC wines will be waiting for you at the end of your day. There’s no more postcard-perfect experience in the Rockies than gliding across Lake Louise as the snow falls silently around you. There’s no end in sight to the trails you can cut across Canada. Cross-country skiing is another Canadian pastime, and a great way to explore while on one of our train trips or downhill ski vacations. The views and wildlife you’ll encounter while peacefully gliding across the vast wilderness promise amazing memories you’ll revisit for years to come.